Beneficial reuse of dredged material for coastal and wetland restoration is a growing practice nationally and internationally. The application and acceptance of dredged material has increased as the multiple project benefits and the impacts of in-water material placement have become clearer. Beneficial reuse has also become an important part of making coastlines and shorelines more resilient to the impacts of a changing climate. As a concept it seems straightforward. Facility X has sediment it needs to dredge to remain operational. Location Y needs sediment to improve, restore or maintain its ecological, flood protection and/or recreational function. Dredge the material from facility X and deliver and place it at location Y, and it’s a win-win. But it’s not so simple when considering where location Y is in relation to facility X, what type and how much material is needed, the timing required for delivery, and regulatory requirements. If facility X needs to dredge now, can location Y actually accept the material, given the use of the site and environmental considerations? And can the benefit-cost ratio capture all the benefits to make the cost more attractive than sending the material upland or offshore? Historically, many projects have overcome these complexities to create, restore or improve coastal habitat and conditions through the use of dredge material: Cat Island in Lake Michigan, Hamilton Wetlands in San Francisco Bay, and Poplar Island in Chesapeake Bay, to name a few. Marina owners and operators who are facing sediment management issues can benefit from understanding how changes in practice and policy will impact sediment reuse projects moving forward. The success of these projects increasingly relies on the collaboration of many partners and an in-depth understanding of the natural environment and sediment system at a regional scale. To better facilitate beneficial reuse projects, the restoration, flood control and dredging communities have begun to collaborate on a regional scale, either through the establishment of coastal restoration authorities or through programs, such as SediMatch in the San Francisco Bay Area. This allows for the prioritization of projects, creates a forum to discuss the challenges for a specific area, and helps identify mutually beneficial strategies to maximize the beneficial reuse of dredged sediment. This type of collaboration recognizes that the dredging community can provide a consistent source of sediment that is needed at restoration sites, and that there may be better ways to facilitate the movement of sediment from harbors, ports and channels to the areas where it’s needed. It also recognizes that the standard methods of placement may not be the most ecologically or economically beneficial. The movement of sediment from dredge site to restoration site is often achieved through mechanical means. This frequently means pumping sediment to deliver material over shallow waters. This has drawbacks from an ecological standpoint, since pipe and equipment placement can potentially cause damage to existing habitat. From an economic standpoint, the expense to build and operate the delivery system requires large projects delivering large quantities of material. For smaller projects, as is often the case for maintenance dredging of marinas, this type of operation can be cost prohibitive. This is leading to an investigation of other methods that would allow for natural tidal or river flows to deliver sediment to the areas that need it and away from areas that tend to accumulate it. These methods seek to improve channel flows and use a combination of mechanical and natural means to deliver and continuously provide sediment to restoration sites, shoreline and wetlands. Internationally, TU Delft Institute has been conducting a variety of different projects to look at the multi-benefit reuse of dredge material. Its Building with Nature program provides some interesting concepts that are attempting to address many of the same dredging and beneficial reuse challenges faced in the U.S. The program also facilitates collaboration between universities, researchers and businesses to develop, test and implement projects. Closer to home there are efforts involving the Great Lakes and Pacific, Atlantic and Gulf Coasts aimed at finding more efficient and innovative ways to move sediment. In Louisiana, the Coastal Protection and Restoration Authority (CPRA) has been working on developing and implementing a master plan for the regional movement of sediment to achieve coastal restoration. CPRA has been analyzing the existing system to better understand the movement of sediment as it flows through the rivers of Louisiana to the Gulf of Mexico. Utilizing this improved understanding of the natural system, it can prioritize multi-benefit restoration projects that create ecological, flood protection and navigation benefits. The restoration projects themselves use traditional placement methods for dredged sediment to establish desired grades, but also augment this with a system-based delivery of sediment to the restoration site. The systems-based approach can include sediment diversions, such as those being constructed along the Barataria Basin and Bay, where the Mississippi River enters the Gulf of Mexico in southeastern Louisiana. These diversions are strategically located to help provide a continued supply of sediment to specific sites through existing flood protection levees. This allows for the restored habitat to naturally respond to future changes without human intervention, and ideally reduces the accumulation of sediment in other locations. Elsewhere in the country this system-based approach is being used to foster collaboration between various agencies, and to advance different dredge material placement methods. 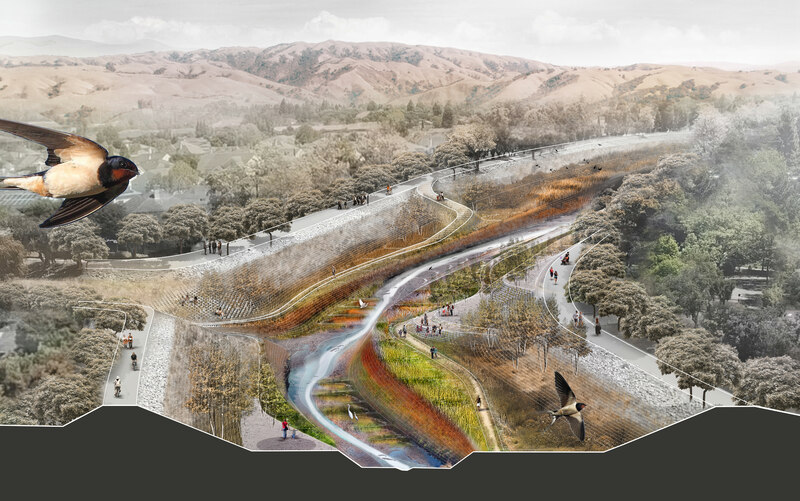 Through the Resilient by Design – Bay Area Challenge, a team of designers, landscape architects and engineers have been working with local restoration, flood protection and recreation agencies as a part of a collaboration called Public Sediment. The group was one of the design teams selected to participate in the Bay Area competition, and the team pooled its collective understanding of sediment movement from the uplands to San Francisco Bay to develop a project that aims to serve as a template for other creeks within the area. Similar to the work in Louisiana, Public Sediment started by developing a comprehensive understanding of where and why sediment was accumulating within the second largest watershed in the San Francisco Bay, drawing on resources from research institutes and work conducted by the regional agencies. This understanding was then used to identify ways to increase sediment delivery downstream to the Bay; the goal is to increase flood capacity in the creek system and provide a consistent flow of sediment to a bayland restoration project at the mouth of the creek. The collaboration used techniques to minimize the risk that the restoration could create potential flood issues for the adjacent community and businesses. In locations where shallow water depths and mudflats create prohibitive conditions to deliver dredge material, new approaches for the placement of material are being investigated. Strategic placement of dredged sediment is being tested by the U.S. Army Corps of Engineers, using a system-based approach to move dredge material to restoration sites. The general concept focuses on marsh spraying or thin-layer placement in the marsh along with nearshore placement and inlet placement (referred to as water column seeding). After placement, the material is spread by allowing tidal water and river flows to deliver sediment to the areas where it is needed within the restoration site over multiple tidal cycles. Some of these placement methods are not considered permittable at a large scale under present regulatory interpretation. However, they are being studied and tested at a pilot/demonstration scale to better inform future projects, as well as changes in regulation to respond to a changing climate. By grounding themselves in a better understanding of the overall system, these new approaches could simplify the operational requirements for providing a supply of dredged sediment to coastal restoration projects, while providing numerous benefits to shoreline ecologies and communities. Chris Devick is a senior civil and coastal engineer with SmithGroup. He can be contacted at 608-421-7321 or at Chris.Devick@smithgroup.com.